This Fort Lauderdale self catering vacation home is one of only 47 private residences . The large open and airy kitchen has beautiful quartz counter-tops, stainless steel appliances and a wall of French doors that open up to the gorgeous views of the pool and ocean. The home is perfect for entertaining large groups of friends and family and has a very large pool and spa that easily seats 10-12 people. Our past guests have said it is the perfect place for a dream vacation. Additionally there are 2 full futons in living room. Where you will enjoy the best of both worlds: the beauty and tranquility. 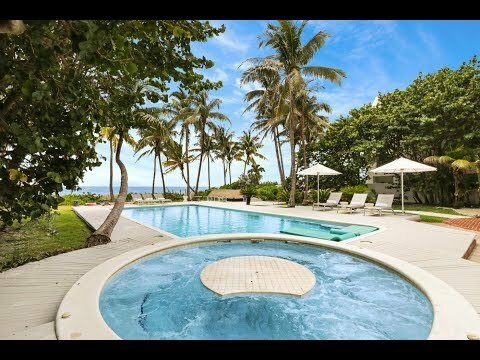 This Fort Lauderdale self catering vacation home features almost 1/2 acre of lush landscaped property directly on 100 feet of sand in the exclusive area of Fort Lauderdale Beach. In addition home offers sweeping ocean views from almost every room. It features a modern 2-story design with two master bedrooms and luxurious master baths each with Jacuzzi tubs. Moreover housekeeper is an optional services . Strategically located to take advantage of attractions in Ft. Lauderdale (Broward), South Beach (Miami), and West Palm Beach. Lots of activities to enjoy — the best one is the beach in your own back yard at this luxurious resort property. Large bedrooms with addition sleeping accommodations. Besides the backyard and and beach attractions. You can walk to some great restaurants (within 5-10 minutes) or drive to Las Olas or South Beach. You have the best of both worlds. Golfing and tennis are great — shopping is wonderful. At Last this home is a great home for multi-generational get-togethers. Optional housekeeper, massage, luxury or exotic automobiles, and private chef services available. This is an amazing destination. Please be sure to confirm your reservation by phone with Debbie, our property manager before you wire funds to our US bank or send a check to reserve your rental. Cancellation: Please ask the manager or check their rental agreement when booking the property. Note: Pet Fee	$500 Refundable damage deposit	$3,500 Our exit cleaning fee is $750 for up to 14 guests -- if you have more than 15 or more guests, the fee is $850. Our pool is heated and we do not charge our guests for heating the pool to 85 degrees -- if you want it warmer than this, there will be an additional charge.. Please note we charge a premium of $1,000 per week when there are 15 or more guests. We do request a list of your adult guests with their names and home address as The City requires preliminary background check for safety. There is a monthly rate of $60,000 in the Winter Season. *Note - we do not maintain the calendar, please contact us for availability. Confirm Reservation w/Debbie before wiring funds to our United State Bank Account. We do not pro-rate 3 or 4 day rentals in our 'off Season.' We have a minimum rental rate of $7,000 9,000 depending upon the number of guests and if it is a Holiday weekend. Off Season is Late May parts of May, late August through most of October. We do not accept credit cards. The house is a unique modern mansion with a gorgeous tropical yard, very rare to find directly on the beach in Fort Lauderdale. Loved that three of the bedrooms were spread out and very private. Master was huge and had a great lounge area. Extremely clean! Wonderful!